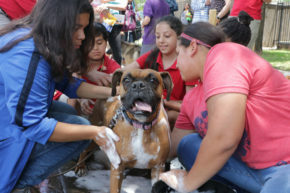 Oak Cliff students host free dog wash with Zoo support | Dallas ZooHoo! What’s the best way to learn valuable information about pet care all while getting your dog to be squeaky clean? Visit a dog wash! 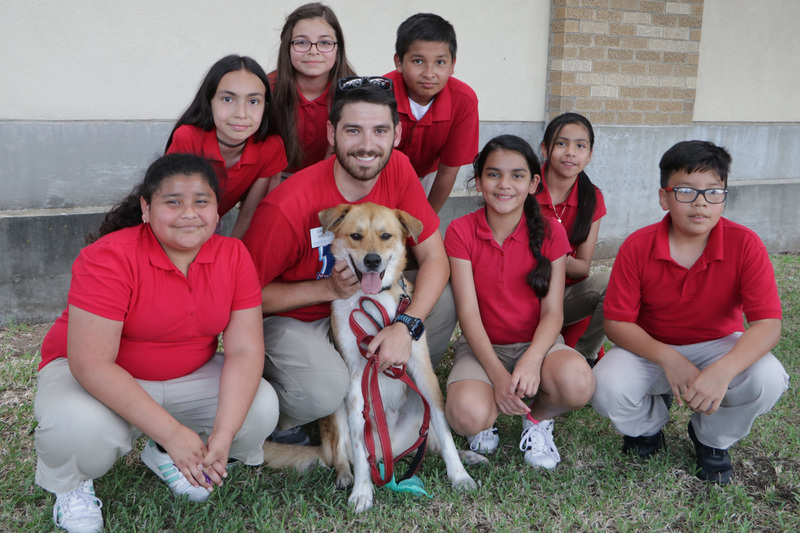 Our AmeriCorps VISTA (Volunteers in Service to America), Chloe Miller, hosted a dog wash event Wednesday in Dallas with the help of elementary students from the Momentous Institute in Oak Cliff. For the past few months, Chloe has helped Momentous Institute children come up with a local project to benefit the animals in the South Dallas community. The students identified an issue within the community and worked to help solve it. When they began discussing proper pet care and stray animals in the area, they saw a concern and wanted to implement a project that would help. Their initiative was quite impressive, too. They made a proposal to their classmates about the need to address this issue, they voted on which solution to pursue as a group, and they had experts come talk to them about viable options. From the very start of Chloe’s time with the students, she wanted to introduce them to conservation work. She was able to help teach 30 students about conversation work while they did a litter cleanup in Cedar Creek. Since then, she has been encouraging them to see themselves as scientists and conservationists rather than passive bystanders. This encouragement seemed to help because the students were very active with their project of choice. All their hard work culminated in Wednesday’s event. For an hour and a half, the kids washed 36 dogs for free while talking to the 100-plus guests about proper pet care, addressing topics like free spays and neuters. Chloe said that during this whole process, she’s seen the students’ eyes light up with amazement as they discover what can be possible with conservation work—an experience she won’t forget soon. This is incredible! You captured our passion wonderfully.